84% Of Conservatives Would Vote To Leave Canada? 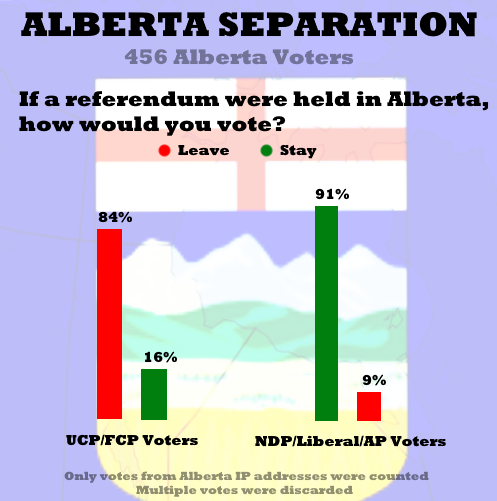 According to Poletical's latest online poll of Alberta voters, 84% of self-identified Alberta conservatives would vote to Leave Canada. Although the poll received fewer votes from participants who self-identified as NDP, Liberal or Alberta Party voters, the numbers paint a different picture among left-leaning voters, with 91% voting to Stay in Canada. Of all participants who were asked, 59% said that Alberta leaving Canada was a realistic possibility. Only votes from Alberta IP addressed were counted. All multiple votes from the same addresses were automatically discarded. This poll should not be considered scientific.